In 2018, U.S. farmers planted over 90 percent of corn and cotton acres with genetically engineered (GE) seeds. These GE seeds can be herbicide tolerant (HT), insect resistant (Bt), or �stacked� with both HT and Bt traits. Use of stacked seeds has climbed since 2000, when approximately 1 percent of corn and 20 percent of cotton were produced using stacked seeds. 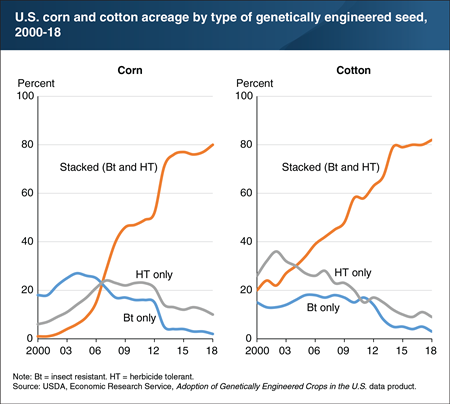 In 2018, by comparison, approximately 80 percent of the corn and cotton planted in the United States used stacked seeds. Increases in the use of stacked seeds may be due to the development of new seed products. For instance, the first Bt corn plant resistant to rootworms was commercialized in 2003, and other rootworm-resistant corn varieties reached the market in 2005 and 2006. The commercialization of these new seed products may have encouraged some farmers planting HT seeds to consider a stacked seed variety instead.